David Brenerman, left, and Justin Costa are sworn in as city councilors by City Clerk Kathleen Jones on Monday at Portland City Hall. Brenerman replaces John Coyne in Council District 5 and Costa replaces Cheryl Leeman in Council District 4. PORTLAND, Maine — It took longer to welcome new councilors and thank departing ones Monday afternoon than it did for the City Council to work through its agenda after inauguration ceremonies. 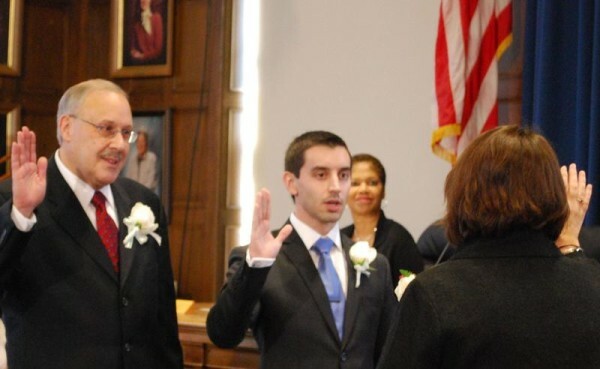 District 4 Councilor Justin Costa and District 5 Councilor David Brenerman were sworn in after winning their three-year terms on Nov. 4. Neither is a stranger to elected office: Costa just completed two terms on the School Board, and Brenerman is a former city councilor, mayor and state legislator. Each of them replaces long-tenured officials. Brenerman has the seat held by John Coyne for two terms. Coyne also served two three-year terms on the School Board and was twice chairman. Costa replaces Cheryl Leeman, who served 30 years on the City Council following one term on the School Board. Brenerman, Costa and the rest of the council had little to say in approving new contracts with 500 union employees in the City Employees Benefit Association, and 32 lieutenants and sergeants of the Police Officers Benevolent Association; each passed unanimously on roll-call votes. Councilors also unanimously approved entertainment licenses for Otto Pizza at 225 Congress St. and Z Dance Hall, which will open in the former Presumpscot Grange Hall at 1844 Forest Ave. The police contract delivers two, 1 percent pay raises retroactive to Jan. 5 and July 6; will increase pay another 1 percent on Jan. 4, 2015, and 3 percent on Jan. 3, 2016. The prior agreement expired Dec. 31, 2013. The new contract will expire Dec. 31, 2016. Tom Caiazzo, the city’s labor relations manager, said the 2016 increase is larger because the union agreed to changes in the city health benefits plan. Contract details provided to the City Council said the agreement was “in principle,” but did not detail how the changes will affect the union. The agreement with 500 members of American Federation of State, County and Municipal Employees Local 1373 extends through June 30, 2016. The prior contract expired on June 30, 2013. The contract contains similar pay increases to the police agreement, with CEBA members getting 1 percent increases retroactive to July 7, 2013, and July 7, 2014; a 1 percent increase due Jan. 4, 2015, and a 3 percent increase due July 5, 2015. The new contract is expected to cost the city an additional $972,000, according to council documents, with $485,000 already set aside in the fiscal year 2014 and 2015 budgets. After stepping aside for Brenerman and Costa, Coyne and Leeman were thanked by Mayor Michael Brennan for their service. “Nobody has been a more dedicated public servant,” Brennan said of Leeman. In the meeting and at a reception following the ceremonies, Leeman said she was not of one mind about stepping away. While Coyne chided her because he was 16 when Leeman was first elected, she said her tenure was something of a surprise. Coyne was kidded by Brennan about shifting from the School Board to City Council when he replaced former Councilor Jim Cohen, but was also called “a voice of common sense and reason” and praised for his other work in the community. Leeman said she received constituent calls right to the end. “People would say ‘before you leave, can you do this?” she said.